there are two types of organic listings on wine bottles. Wines can be made from certified organically grown grapes, avoiding any synthetic pesticides or additives, or, to take it a step further, “organic” wines are made from organically grown grapes, and are also made without any added sulfites (though naturally occurring sulfites will still be present). is similar to organic farming in that both take place without synthetic chemicals, but biodynamic farming incorporates ideas about a vineyard as an entire ecosystem, and also takes into account things such as astrological influences and lunar cycles. A biodynamic wine means that the grapes are farmed biodynamically, and that the winemaker did not make the wine with any common manipulations such as yeast additions or acidity adjustments. A wine “made from biodynamic grapes” means that a vintner used biodynamically grown grapes, but followed a less strict list of rules in winemaking. refers to a range of practices that are not only ecologically sound, but also economically viable and socially responsible. (Sustainable farmers may farm largely organically or biodynamically but have flexibility to choose what works best for their individual property; they may also focus on energy and water conservation, use of renewable resources and other issues.) Some third-party agencies offer sustainability certifications, and many regional industry associations are working on developing clearer standards. In 2018 we will start introducing Italian sulphites free organic wines and other product in respect of human good health and respect for the life stock. For this summer we will offer different kind of mozzarella in our menus and courses, do not miss this opportunity to compare texture, taste and consistency of this amazing Italian product. ABOUT BURRATA: Burrata, meaning “buttery” in Italian is a fresh cheese made from a mix of mozzarella and cream. The outside thin shell is a pasta filata curd made of buffalo and/or cow’s milk mozzarella while the insides contain a soft, doughy, stringy, mixture of curd and fresh cream. The cheese originated in the Apulia region of Italy known for sheep farming and agriculture. It is sold traditionally in asphodel leaves with a polyethylene plastic bag over it. The green colour of asphodel leaves is an indicator of the freshness of the cheese. ***When you cut open a Burrata, it oozes with buttery and creamy panna containing scraps of mozzarella. The cream has a rich flavour and has to be eaten immediately since it is a fresh cheese. This is prepared exclusively with whole cow’s milk. Mozzarella and fiordilatte have a similar processing technique, but a different taste. Fior di latte has a more delicate taste than the mozzarella, and a paste that oozes milk that makes the cheese extremely soft. Used in various preparations and served cooked or raw. Mozzarella di Bufala Campana d.o.p. is a soft spun table cheese from whole buffalo milk; Nowadays widely available in many supermarkets worldwide. The aromas are more intense since it is buffalo milk: the slight sour, the cream and a hint of musk characterise this excellent product. Very interesting fact about this venetian wine is the natural genetic mutation undergone by the Rondinella variety from red grapes into white grapes. Enveloping, rich, complex, fruity finish with a persistent mineral presence in the mouth. Perfect for this summer!!!! The Calvarino vineyard is in the heart of the Soave Classico zone, the soil here dates back to the tertiary era and is rich in clay and tufaceous basalt which give the wine an attractive savoury, mineral quality. White asparagus this year are coming directly from the most famous tow of Bassano del Grappa in Veneto where the culture of the white asparagus has been brought to it’s maximum by the passion of the local gourmands. White asparagus isn’t easy to harvest: Kept from the sun in manicured dirt mounds, it must be painstakingly cut at just the right length and thickness. When you cultivate asparagus, you must have a passion for it. 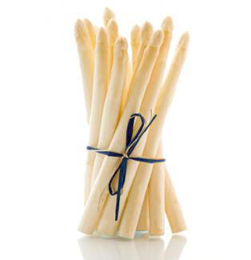 The Bassanos White Asparagus DOP has the following features: white, length between 18 and 22 cm and the central minimum diameter of 11 mm, shoots well formed, straight, with entire compact tip, tender and non-wood, to look and smell fresh. It is also permissible by the specification the presence of some transverse fissures of the shoots, the product element of quality and identification Bassano, due to the low fibrous that is the principal qualitative characteristic. The Asparagus of Bassano DOP Bianco has a bitter-sweet taste characteristic that sets it apart from all other species of asparagus. It is normally sold in bunches of 1.0 kg or 1.5 kg, (although the specification allows the marketing of clusters ranging from 0.5 kg to 4 kg), all uniforms and tied with a willow epicormic shoot called “stroppa “. In “stroppa” it is inserted the flag mark representing a bouquet of white asparagus and the Palladian bridge, both stylized, with the numerical codes that lead back to the manufacturer, to the day of collection and packaging of the product. 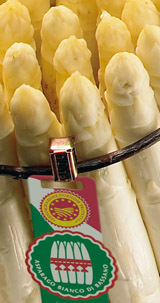 Above the asparagus is clearly visible the official European certification mark of the protected designation of origin. 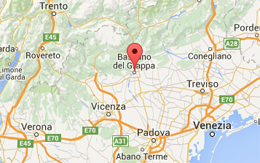 All this is overseen by the Consortium for the Protection of the asparagus of Bassano del Grappa White PDO, which scrupulously abides by the specification of the protected designation of origin, recognized by the Italian Ministry of Agriculture with the approval of the European Economic Community, in September 2007. Two local farmers’ groups carefully monitor the origin and the quality of their white asparagus. Real Bassano asparagus is bound with willow branches and carries a green or red tag. In our menus, for two months, the white asparagus will be the king of the table, the undisputed star, from row to boiled, then frozen and last but not least you can taste it in our desserts. This time is an experience not to miss!!! The ideal sipping accompaniment for the Bassano del Grappa white asparagus is the Vespaiolo wine from the Breganze area in Veneto region, an indigenous grapes variety which grows in the area is a perfect combination of acidity and semi-aromatic texture to accompany the sweet-bitterness of the asparagus. Dear customers and friends, from October the 29th (thu) until November the 3rd, we will be present at the Italian fain in Tokyu department store in Shibuya, right on the top of JR Shibuya station with our home made specialities! 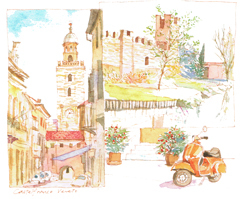 Please come to visit us and enjoy some real Italian dishes! Wi’ll be serving our home made sausage and tomato pasta, venetian style dry salted cod mousse and marinated sword fish plus desserts and Stefano’s special “VOV” (egg and marsala wine base liquor). I am here to introduce you our new gourmet discovery, an organic Italian vegetables farm run by an Italian passionate for quality. This August we discovered a farm run by an Italian young person, Mr. Silvio, whose dream is to provide Italian restaurants and people in Japan the real flavors of the Italian vegetables. Each vegetables seeds have been selected from its original region in Italy and carefully brought to Japan. He achieved to grow many different kind of vegetables from many regions and each one following its own season. Now, besides us many prestigious restaurants in Tokyo are relying on him to give our/they’re customers the best and real vegetables available in Japan. For this occasion we created this two courses in which you can taste the real beauty of the Italian flavors, it is like to be eating in Italy. I can ensure you that you won’t find a better bell pepper or eggplants in Japan, bell peppers tastes as the bell peppers and eggplants are as those one we used in Italy, soft and gentle texture with a sweet finish, melting in your mouth at every byte. I won’t keep you long, when the product is excellent, words are meaningless. Of course we managed to insert this top quality vegetables also on the a la carte menu. Ristorante Stefano is offering this week white truffle at an astonishing 800yen per g, first quality from ALBA in Piedmont, a prestigious first class ingredient to enrich your dishes and your feelings! Get it now at this fabulous price!! Today’s white truffles, just arrived 15 minutes ago!! We will be closed from Monday the 11th to Thursday the 14th of August. We will open from Friday the 15th from 18:00. From January, every Tuesday and Wednesday lunch we are closed. please visit us another day. Call us for any enquiry, parties or bookings.